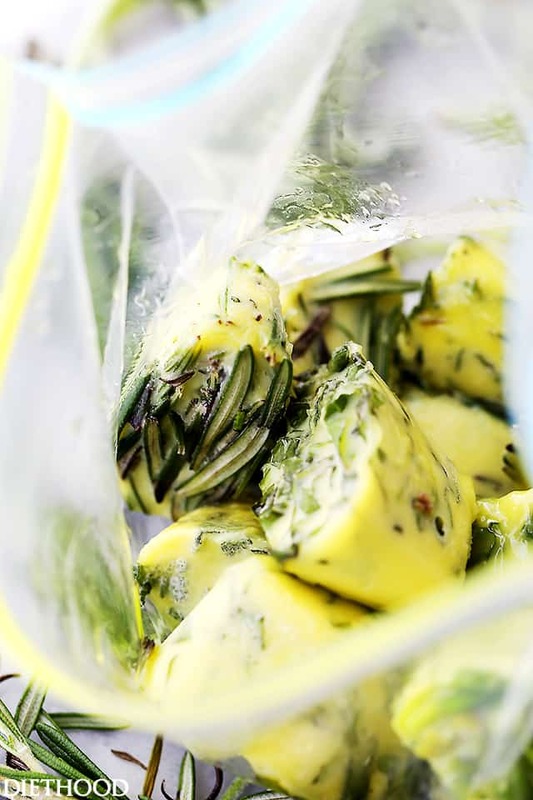 How to Freeze Fresh Herbs in Olive Oil – Freezing fresh herbs in olive oil is the perfect way to preserve herbs! AND! It can go from the freezer straight to the frying pan. No thawing needed!! Should I scream louder?! Hey YA! Happy start to the week! I hope we all have a great one! With my dad’s health issues lately, all I care about is that we (that includes YOU) have our health. That is all we need. AND food. Good food. Err. Good FOR YOU food. Like fresh herbs! I’m going to start this post by convincing you to go to the grocery store and stock up on all the fresh herbs that you can find. Don’t worry about the dang astronomical price that is attached to them… I mean, who cares that we’re paying Gucci prices FOR GRASS! Don’t get me started. But yeah. Let’s not worry about that because now I’m going to show you how to preserve them herbs so they last for as long as you need, instead of them dying 3 days after purchase!! Ugh. Like I said, don’t get me started. P.S. A 0.75-ounce package of basil is $4.79 at my local grocery store. IN.SANE. P.S.S. It doesn’t help that in mid May we’re still dealing with cold temps and lots of rain. But anywho! I just wrote (typed) any hoe… thanks for catching that, auto correct! So. Preserving herbs in olive oil is one of my favorite kitchen hacks and I am kind of excited to share this thingamajig with you. 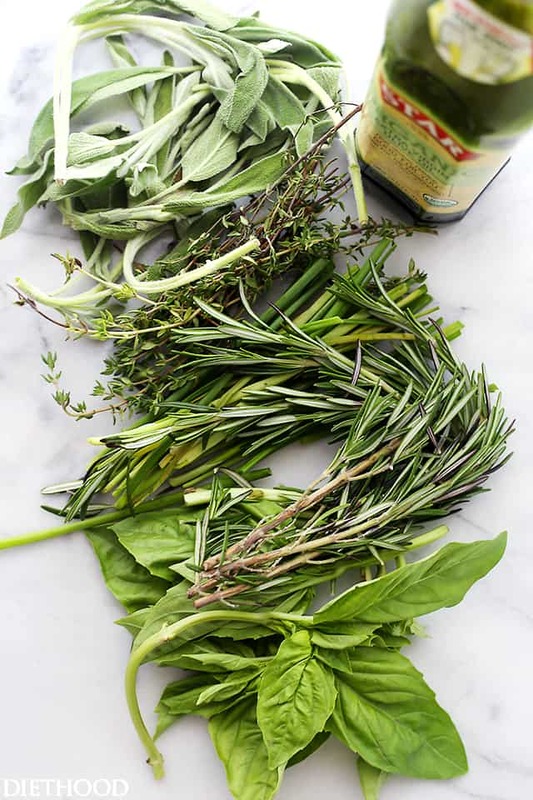 I used to get really mad at myself every time that I forgot about the bunch of fresh herbs that suddenly decided to wilt way before I was ready to use ’em. In search of a solution to this problem – thank you, Google! – I found this very helpful piece by The Gardener’s Eden, and have been using their awesome method for the past couple of years. 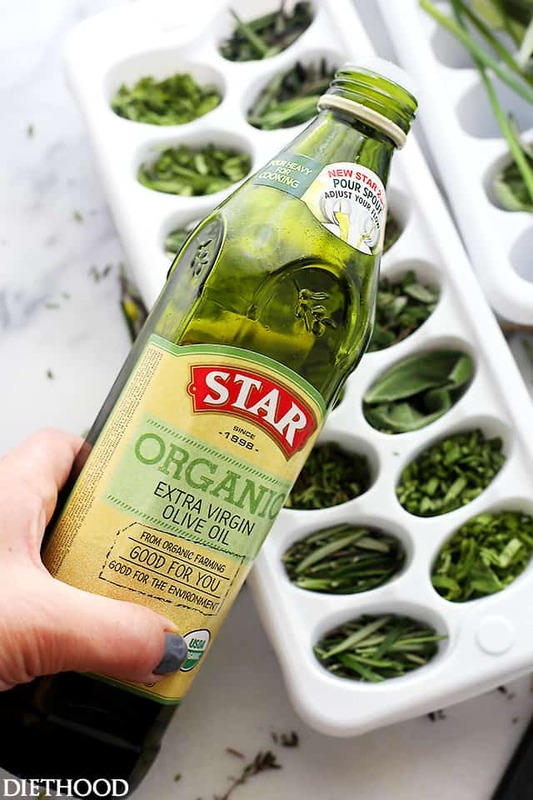 For the reason that I very often use STAR’s Organic Extra Virgin Olive Oil in my cooking, I almost always use it when I’m ready to freeze those herbs. It’s bold and it has a rich fruity olive taste that pairs very well with rosemary, basil, and thyme. 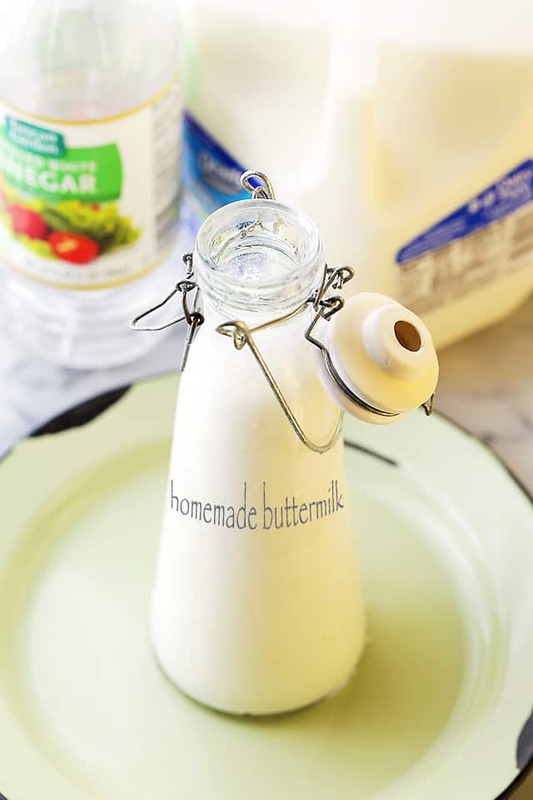 I also love the 2-in-1 pour spout. It’s very convenient when you need to pour out a slower stream of olive oil over the ingredients. Coming atcha like a dark horse, this magical hack is everything. Apart from the preserving deal, the cooler thing is that you can remove a piece from the freezer, throw it in the pan and bam! 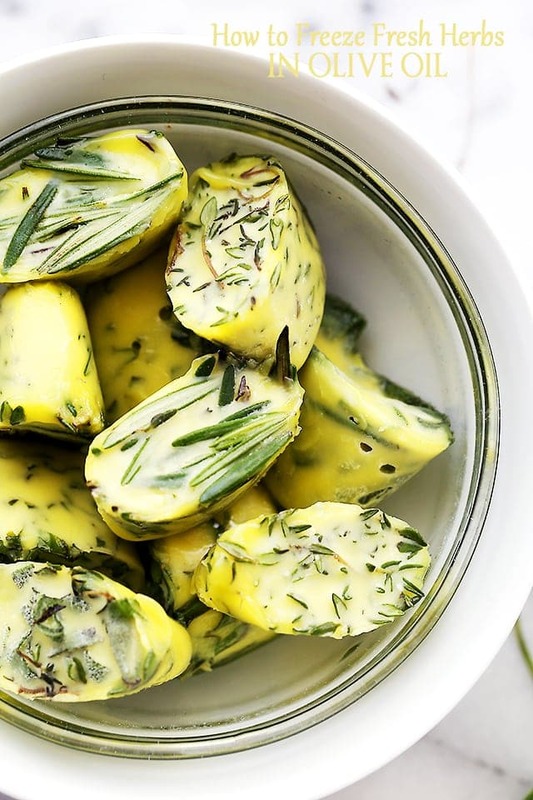 Like, you just killed two birds with one stone; you didn’t have to pour out the oil AND you didn’t waste any energy on chopping up that rosemary! Easy as pie, even a 3 year old can do it! My little ones love to help out with this project, which happens about once a month. I’m a food blogger, I use LOTS of oil and herbs… aaaand everything else. 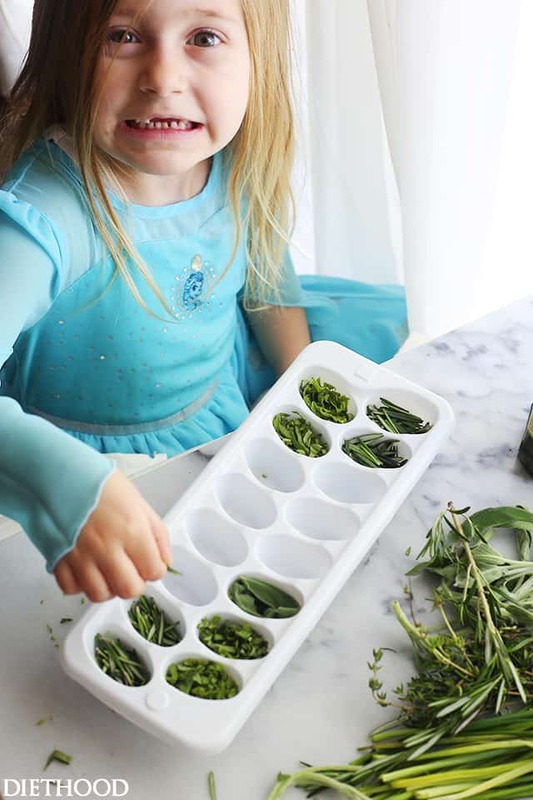 And just like that, you have yourself a bunch of frozen oil cubes filled with aromatic and oh so delicious rosemary, oregano, basil, thyme… I LOVES IT! 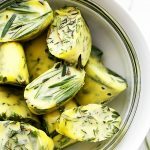 Do you have any tips about preserving herbs? I’d love to know! STAR Organic Extra Virgin Olive Oil is available at Save Mart, select Walmart & Target stores and online at STAR Fine Foods. 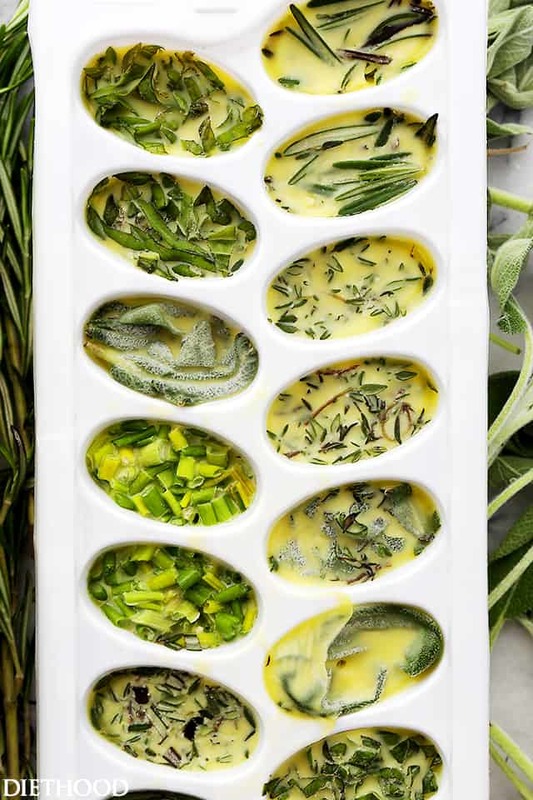 How to Freeze Fresh Herbs in Olive Oil - Freezing fresh herbs in olive oil is the perfect way to preserve herbs! Pour extra-virgin olive oil, covering the herbs. Thank you! My husband planted an herb garden for me this year and I’ve been worrying that I can’t use them all fast enough! This is brilliant! I’m wondering about a longer freezer shelf life if I dumped the “cubes” into a ziplock baggie with all the air removed??? to store longer?? I’m going to try, if they’re not great, I haven’t lost anything, right? Thank you again for this wonderful idea! Very cool idea. I would suggest using a different oil rather than olive oil though. 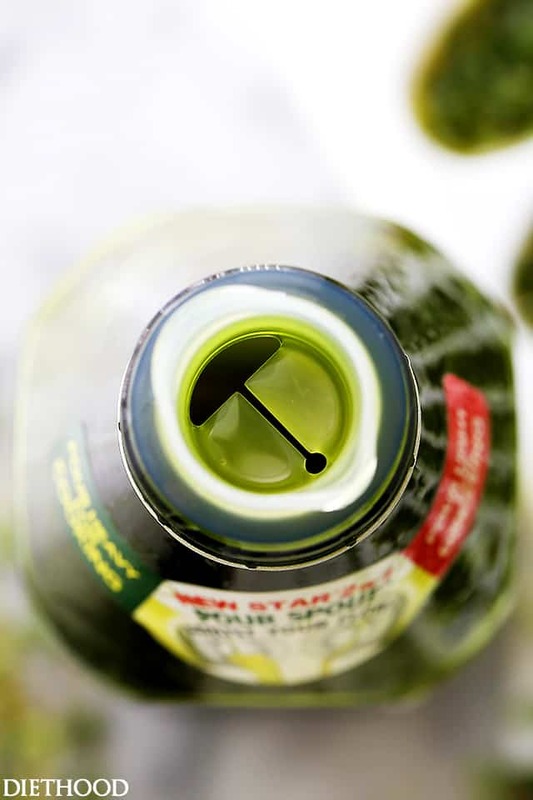 Olive Oil has a very low smoke point and the molecular bonds are easily disrupted. Its meant more for dressings and dipping. Heating it for frying basically is turning into trans fats and we all know enough about trans fats to know we need to stay away from them. I would suggest a coconut oil that’s slightly heated to liquid and then poured into the ice trays. Its a saturated fat (meaning “stable”) and will not be affected by the heat. I realise this is a little bit of a promo for the olive oil, but I’m more entranced and envious of your ice cube tray. Where did you get it from? I must have one the same! PS if you don’t have ice cube trays, use a cupcake tin lined with plastic wrap but keep the filling small! Like the ideas…but can’t get rid of that sidebar for pinterest,yum,FB, twitter, etc…makes it hard to read the recipes Can’t even seen to type name and email…doing it blindly and hope it works! I know it’s not a herb but I have a tip with fresh ginger to save money. I’ve been doing it forever and never waste any. Buy the youngest firmest ginger when you come across it. 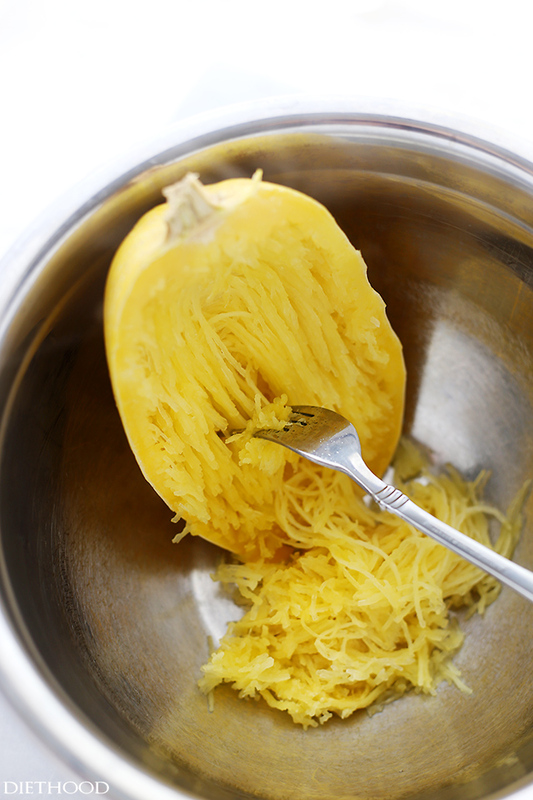 Give it a quick wash and dry then into a bag in the freezer then whenever you need some you just grate it into your cooking peel and all (you won’t see or taste the skin plus I’m sure it will have extra nutrients like most things do under the skin) then put the rest back in the freezer! Last for ages too. I’d never store it any other way since I don’t use it all the time. HI Sue!! I love this tip – that is so good to know!! Thank YOU very much for sharing! I’m a fan of freezing ginger too. I chop up the ginger, place it in an ice cube tray, add a little water, then add the frozen cubes to a small container. I use the ginger in dishes, but mostly use the cubes to make a drink of ginger and honey – boil one or two cubes of ginger for 10+ minutes and add a little honey – has wonderful health benefits and tastes good too, and is a good “good night” drink. Thank you for the hint about freezing the ginger without chopping or grating it as sometimes I like the ginger to be more finely chopped or want to slice it into slim slices. Okay, I just have to say that this is brilliant. Every time I throw away old, unused herbs that I paid an arm and a leg for, I die a bit inside. And lovely photos, as always! Great idea. Where the recipe states to use within a week, do you mean a week after it is frozen or within a week of thawing it out after it has been frozen for a certain amount of time? Hi Bee! Yes, after they are frozen try to use them within about 2 weeks. And you don’t have to thaw them – just place in a frying pan and the cube will begin to melt right away over any amount of heat. I have a food saver and store them in that and they store for a year…. Take out what you need and reveal! Oh wow this is genius. I must do this sometime soon. Loving the pictures! Okay, this is practically ART! So gorgeous! I’d be almost tempted to just plop those beautiful cubes straight into my mouth! I love this so much! Would love to just pull some Fresh Herbs out of the freezer! I’ve done this with pesto, but my brain just exploded – I can use it for all my herbs! I have quite the nice little thyme garden going, and I miss that fresh flavor during the colder months – but now I don’t have to!